A new fruit-shaped sensor could help cargo companies to keep fruit fresher in transit, researchers say. The device – which mimics the size, shape and composition of real fruit – is packed in with produce in transit and closely monitors its temperature. It comes in orange, apple, banana and mango varieties, and alerts firms to problems with their cooling processes, allowing them to take action. It could also lead to fresher fruit for consumers, researchers said. The project, which is still at the trial stage, is being conducted by the Swiss Federal Laboratories for Materials Science and Technology (Empa). Communications spokeswoman Cornelia Zogg explained: “Mangos, bananas and oranges have usually travelled long distances by the time they reach our shops. “However, not all the cargo makes it safely to its destination. The researchers say this creates risks for both suppliers and consumers. State food agencies can order container loads of fruit to be destroyed if it hasn’t been stored at the right temperatures. And fruit which is overripe or not fresh can end up being sold to consumers. “Cargo could be left outside during a layover, or you could have a power outage during transit, all of which affects quality,” project leader Thijs Defraeye told the BBC. The fruit’s composition is modelled using computers. To achieve this, the team X-rayed real fruits and modelled their shape and texture, he says. They then determined the exact composition of each fruit’s flesh and simulated it in a laboratory, using a mixture of water, carbohydrates and polystyrene. 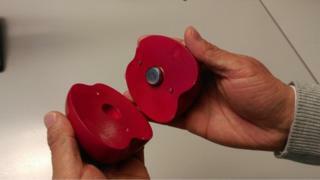 The mixture was poured into a fruit-shaped sensor mould, created on a 3D printer. Mr Defraeye said: “If something goes wrong, suppliers will be able to access the temperature data from the whole journey and work out what happened. Field tests for the sensors are under way and the researchers are looking for potential commercial partners.